Status notification via email and/or text message. Monitoring each individual inverter allows us to notify you if one is not generating to par. Time of Usage analysis (TOU). You'll know if you can benefit by switching to TOU. Access from any web browser world wide, including PDA/Smartphone/iPhone. 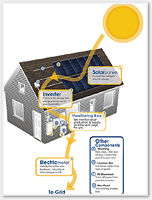 Can be installed by any electrician, solar installer, or anyone familar with electrical. Uses its own wireless network, customer must have high speed internet with 1 open network port. We are located in Southern California. Our HEM can be installed by any electrician or even an end-user who is familiar with electrical circuits. Our installation services are extra and are limited to Southern California. We do offer free phone support for installation. As a user of Xantrex inverters ourselves, we experimented with their monitoring gateway. We like Xantrex inverters but we were not happy with their monitoring solution. So, we decided to create our own. Our custom solution is roughly 4" by 4". It uploads(pushes) data to our web site every minute. This means there is NO need to open any special ports or modify your home/office network. Your network remains secure. No need to modify your network to view your stats either. Our monitoring gateway sends a small packet, roughly 100 bytes, every minute to our site. Our site processes these packets to create real-time log files, graphs, charts, and email/text message notifications. Our system of using these small packets means there is no noticable network traffic. See the demo link to the right for a real-time working system. Our Product is maintance free. All it does is send data. All the real work is done on the web site. So modifications or enhancements to the system are ongoing and done at our location. Any/all new charts/graphs we design are immediately accessible to you. If your internet goes out, no problem. Our system will keep weeks of data. As soon as your internet connection is restored it will resume sending data and log all the data it missed. Our product takes it a step futher. Not only do we monitor how much power you are creating but we have the ability to monitor what your using. This allows us to provide Net Metering. We show you the difference between what your making and what your using, hour by hour. Using our graphs you can monitor whether TOU would be beneficial and could save you money. While we hope that you never experience a parts failure, if something does happen all parts are covered by a one year warranty. Depending on the failure a part may be sent directly to your address or a technician may need to be dispatched to replace the part. If a part can be sent to you a shipping fee will be required. If a service technician is required a small service fee will be charged. If after the one year warranty coverage something happens, we will assess the situation on a case by case basis. Unless you are otherwise notified, when receiving a replacement warranty part, you are responsible for returning the defective part to us within 14 days of receipt of the replacement part. Failure to return the defective part within 14 days may result in charges for the then-current standard price for that part.